One year ago, Hallie Moore’s twin sister, Heather, died. The death of a twin would be difficult enough, but the fact that she was murdered makes it that much worse; for Hallie, and for Heather’s husband and small son. On the anniversary of her sister’s death, Hallie, a television reporter, visits, not Heather’s grave, but the site of her death. Hallie always feels more connected to her sister there, as if her sister’s energy still inhabits the place. On this particular day, Hallie is stunned to get a flashback of her sister’s death, from her sister’s point of view. True, the two girls had an almost psychic connection as children, but Hallie hasn’t experienced anything like this. On the outside, Hallie is a pragmatic reporter. But privately, she remembers that connection to her twin and wonders if there’s something else to our existence. Since her sister’s killer was never caught, Hallie takes that violent vision as a sign, and throws herself into her own investigation. She talks to paranormal experts, lets herself be hypnotized, anything that might help. When strange things start to happen, she’s sure that her dead sister is sending her signs. But she doesn’t realize that she’s placed herself squarely in the killer’s sights. The killer believes that something was left undone in his crime a year ago; he believes that “she” will be back, and that he’ll recognize “her” no matter what face she wears. When he sees the twin of his victim, he believes his destiny is clear. This is an incredibly creepy paranormal thriller. Not precisely horror, per se, readers who enjoy horror novels will still enjoy this one, since it delivers plenty of scares. The atmosphere is effectively established in the prologue, and carried through the novel. It’s obvious that the author did his homework. Each of the characters has a complex and believable life. They’re all trying to go on after Heather’s death; even the killer. The action switches from Hallie’s point of view to that of the killer. In the process, the killer reveals his identity. This is hardly a problem, though, since it lets the reader watch Hallie edge closer and closer to him. 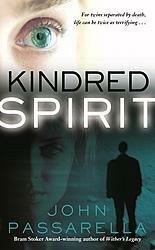 If you’re looking for thrills and chills, you can’t go wrong with KINDRED SPIRIT.